Fort Lauderdale's five-star rated glass repair service, Express Glass has announced a coupon clarification for Memorial Day, 2016. The company will honor the 10% coupon on its website for repairs on May 30, 2016. 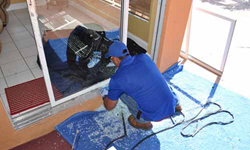 Express Glass of Fort Lauderdale, a top glass repair service including for sliding glass doors, is issuing a clarification on its popular 10% coupon for glass repair and replacement work not only in Fort Lauderdale but in surrounding communities. While many competitors shut down for the holiday, not only will Express Glass be open but it will honor its 10% coupon for those customers who reside in Fort Lauderdale and so indicate. To learn more about Express Glass, Ft. Lauderdale 10% glass repair coupon go to http://www.expressglassfl.com/fort-lauderdale-glass-window-repair/. There, scroll about halfway down the page and click on the 'instant 10% off.' It is important to mention that one resides in Fort Lauderdale to take advantage of this Memorial Day opportunity. A three-day weekend provides Florida locals an extra day to plan for glass repair and replacement for sliding glass doors and windows. Glass repair coupons offer the budget-wise incentive homeowners and businesses search for. While competitors not only close for the day but also invalidate any discounts or coupons, Express Glass has made it easier for Fort Lauderdale locals to save money as they kick off Summer, 2016.